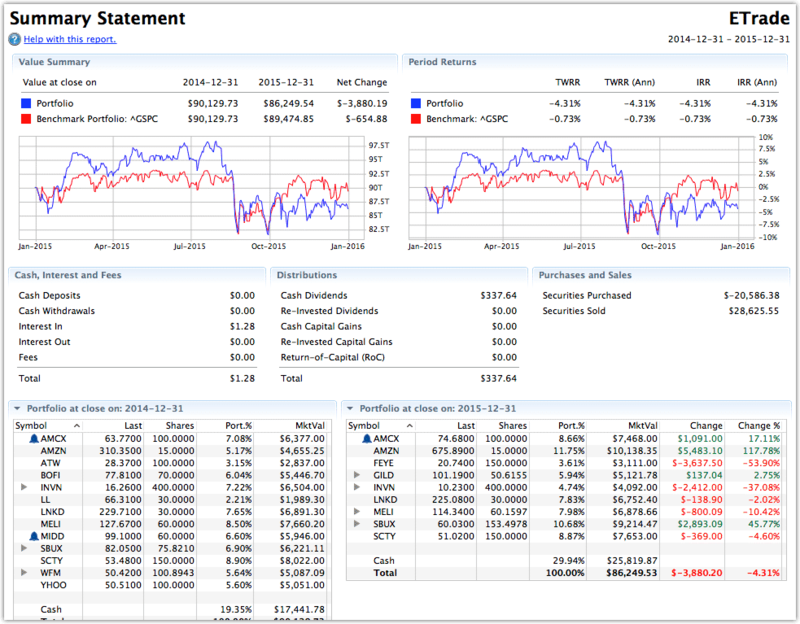 StockMarketEye is portfolio management software designed for investors who like to be hands-on. Because it provides a bird’s eye view of many portfolios in one place, it is ideal for investors who are frustrated at having to log into multiple brokerage accounts. More than providing a bird’s eye view of your overall investments, the downloadable software has a suite of tools designed to help you make better investing decisions. It’s simple enough to provide instant insights into your portfolios yet powerful enough to help you track stocks, mutual funds, ETFs, and currencies from around the world. Whether you are tracking real-life portfolios or keeping an eye on future opportunities as part of your watchlist, StockMarketEye helps you to organize your investments simply and easily. Is StockMarketEye Right For You? If you prefer a hands-on approach to investing, StockMarketEye provides a powerful tool to give you insights that can help you make investing decisions. Passive investors who prefer the idea of an automated investment approach should look to robo-advisors like Betterment or Wealthfront. 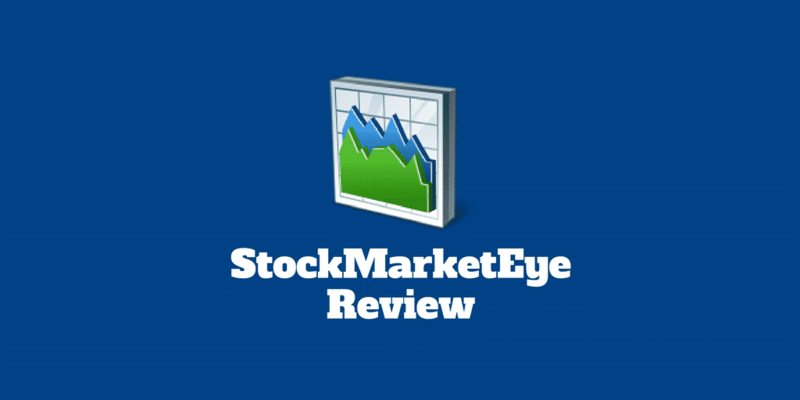 But for active investors or traders, StockMarketEye has a powerful software suite that is downloadable and accessible on virtually all devices, including Macbooks and PCs, as well as iOS, Android, and Linux devices. So, what can you do with StockMarketEye? You might think your portfolios are in good shape and well diversified but it’s not until you put them into a single dashboard that you can see where you may have too much exposure to a single stock or too little exposure to a specific sector like healthcare or technology. StockMarketEye enables you to bring together all your accounts from every brokerage, whether thinkorswim, tastyworks, Schwab or elsewhere. It is easy to import portfolios because the most popular file formats are supported. Once they have been imported, you can view gains and losses quickly, compare your investments to benchmarks like the S&P 500, NASDAQ, Russell 2000, or Dow Jones Industrial Average, and group portfolios together. Whether you are watching CNBC, Fox Business, or Bloomberg, or simply reading up on a new company in Investor’s Business Daily, you will quickly find an abundance of new investment opportunities. To help you organize your existing portfolio positions and new stock candidates, whether Netflix, Facebook, Amazon, or some other company, StockMarketEye can track hundreds of securities at one time. It doesn’t matter whether you are researching stocks, mutual funds, or even currencies, StockMarketEye caters to them all. So, if you are trying to figure out which are the best Vanguard funds and comparing VFIAX vs VTSAX, you can perform enhanced due diligence and even receive alert notifications. StockMarketEye shines with its rich selection of stock charts. Whether you need basic charting features like moving averages and oscillators or you want to spot stock splits and dividends on charts, you can view built-in charts or separate window charts easily. Both end-of-day and intra-day charts are available in 6 chart styles that allow for zoom functionality and include 14 technical indicators. You can even use comparison charting for improved analysis. You can download and use StockMarketEye at no cost for 30 days. StockMarketEye has a dizzying array of features designed to help you better manage your investments. If you ever traded on the thinkorswim trading platform from TD Ameritrade, you will be familiar with downloadable trading applications. Think of StockMarketEye similarly as a downloadable application. After a one-time payment, you need to download the software to access the suite of tools. It is not designed as a web-based platform but it is compatible with Windows and Mac, as well as iOS and Android if you prefer to use mobile devices. 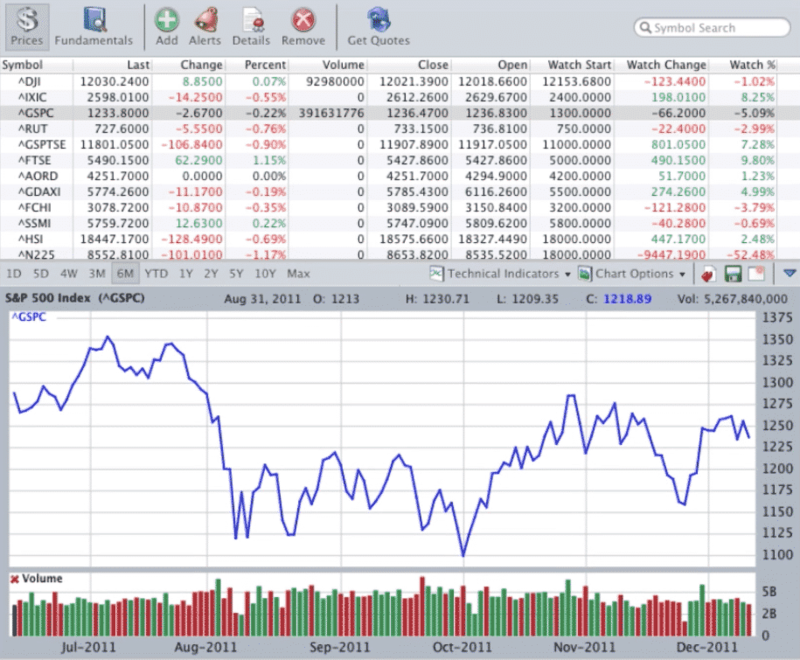 Even Linux users can use StockMarketEye. Once you download the software, you can try it out free for 30 days. Simply import your portfolios from your brokerage account. Popular file formats like CSV, QIF, or OFX are all supported. Or if you don’t have any brokerage accounts or existing portfolios, you can manually enter stocks, mutual funds, or currencies. Once you have imported data or created your own watchlists, you can set up reporting, track gains and losses, view stock charts, compare performance to benchmarks, and group portfolios together easily. ✅Powerful Software: StockMarketEye has an extensive range of features, including portfolio management, stock charting, investment reporting, stock alerts, and benchmark comparisons. ❌Web-based Interface: Users who prefer an online interface will be disappointed to discover the software is downloadable vs web-based. ✅Wide Selection Of Securities: Whether you invest in stocks, mutual funds, or currencies, StockMarketEye caters to your investing preferences. ❌Polish: StockMarketEye feels a bit dated when it comes to user experience and user interface in a world where cutting-edge tools like Personal Capital shine. ✅Highly Compatible: Unlike some tools that are compatible only with some operating systems, StockMarketEye can be used on PCs, Macbooks, iPhones, iPads, and Android devices. ❌Alternatives: Many of the features such as stock charts and benchmark comparisons are available free elsewhere, so users with just one brokerage account may experience less value than those with multiple portfolios at multiple brokerage houses. ✅Frequently Updated Software: The software is constantly being updated with new versions to improve upon older versions. ✅Mobile Friendly: As long as you have an internet connection, you can keep up to-date while on-the-go because StockMarketEye can be used on mobile devices. ✅Real-time Data: StockMarketEye supports real-time data from numerous exchanges. ✅One-Time Payment: For a single payment under $100, you get a whole lot so the value for money is excellent. ✅Free 30-Day Trial: You can download and use the software free for 30 days while you’re trying it out. ✅Customer Support: StockMarketEye earns consistently high marks for delivering quality customer support. You can track the following securities with StockMarketEye. No hidden fees, monthly subscriptions, or ongoing charges are associated with your purchase. Simply pay a one-time fee of $99.95 and you’re set to go. For investors with multiple portfolios scattered across different brokerage accounts, StockMarketEye helps to gather all your investment information into one dashboard view. The portfolio management software is helpful in surfacing problems that may otherwise go undetected. For example, you might discover that you have too much exposure to a particular stock, mutual fund, currency, or sector. You can research companies, view chart studies, create watchlists, and add notifications easily no matter whether you are using Windows, Mac, Android, iOS, or Linux. For users who are accustomed to polished user interfaces, StockMarketEye may leave you disappointed but it does the fundamentals well. If you like the idea of quickly and easily getting a bird’s eye view of your investment portfolios, whether taxable or retirement, for a one-time fee from a technology provider who has a reputation for top notch customer support, StockMarketEye is well worth checking out. ‹ CD Calculator – How Much Interest Can You Earn?